Let me start by saying thank you for taking the time to read this article. Time is a prescious entity in college life. The way we use our time says volumes about who we are. I hope that as the semester progresses, you will spend a little time reading some of the wonderful articles we will be publishing. For now, I would like to discuss why The Echo chooses to serve SNU’s community. What exactly is it that you get out of The Echo? Primarily, The Echo provides you with useful information. In a world where each one of us is flooded with information every day, it’s easy to forget that very little of it has any effect on our lives. The Echo aims to give you news that is beneficial to your life. That’s not to say that national news is bad and should be ignored. Everyone should strive to understand the issues and opinions that make up our country. However, if we want to have an impact in our local community, we first must know about our local community. Along with local news and information, The Echo publishes thoughts and ideas from a wide variety of students. While in college, we have the unique opportunity to build relationships with many different kinds of people. Each person’s voice matters, despite whatever their background or beliefs may be. At The Echo, we share these unique perspectives with you through reviews and editorials. We want to share your interesting and thought provoking ideas that spark discussions across campus. 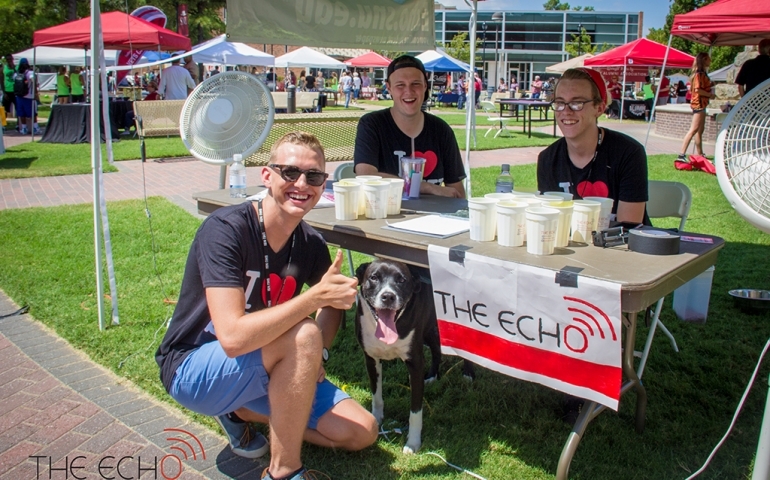 The Echo also works to provide students, at SNU, a sense of belonging through weekly meetings. Here, we learn about each other, what we value, and what we want to become. Personally, I am not the kind of person who can instantly connect with new people. However, being a part of The Echo has given me the opportunity to befriend several students, whom I wouldn’t have come to know otherwise. We welcome everyone to participate in the creation of SNU’s own online newspaper. I am honored to be working as the editor-in-chief of The Echo. For about two weeks now, my fellow editors and I have been planning and shaping our vision for this year. However, we can not produce a student newspaper without the help of you, the student. I implore you to come to an Echo meeting, which occur every Monday afternoon at 5 in Herrick 228. If you can’t come to the meeting but still have an article you wish to write, email me at mvierow@snu.edu and we will work with you throughout the publishing process. Even if you have an idea for an article but don’t have time to write it out, we still would like to hear from you. The Echo is here to serve the student body, and we are excited to do so this school year.